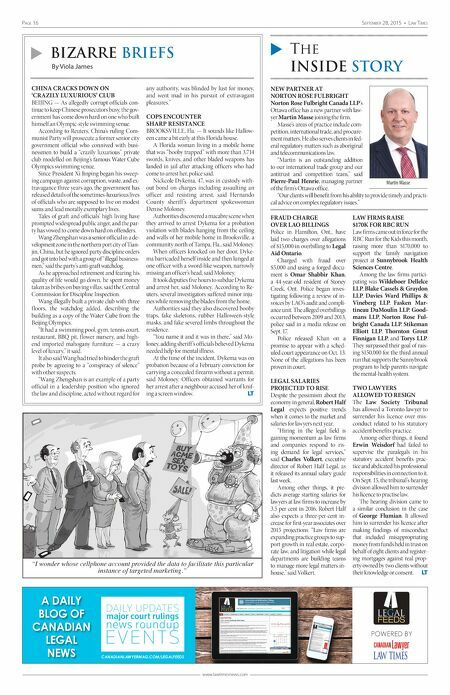 Page 16 September 28, 2015 • Law timeS www.lawtimesnews.com NEW PARTNER AT NORTON ROSE FULBRIGHT Norton Rose Fulbright Canada LLP's Ottawa office has a new partner with law- yer Martin Masse joining the firm. Masse's areas of practice include com- petition, international trade, and procure- ment matters. He also serves clients in fed- eral regulatory matters such as aboriginal and telecommunications law. "Martin is an outstanding addition to our international trade group and our antitrust and competition team," said Pierre-Paul Henrie, managing partner of the firm's Ottawa office. "Our clients will benefit from his ability to provide timely and practi- cal advice on complex regulatory issues." CHINA CRACKS DOWN ON 'CRAZILY LUXURIOUS' CLUB BEIJING — As allegedly corrupt officials con- tinue to keep Chinese prosecutors busy, the gov- ernment has come down hard on one who built himself an Olympic-style swimming venue. According to Reuters, China's ruling Com- munist Party will prosecute a former senior city government official who connived with busi- nessmen to build a "crazily luxurious" private club modelled on Beijing's famous Water Cube Olympics swimming venue. Since President Xi Jinping began his sweep- ing campaign against corruption, waste, and ex- travagance three years ago, the government has released details of the sometimes-luxurious lives of officials who are supposed to live on modest sums and lead morally exemplary lives. Tales of graft and officials' high living have prompted widespread public anger, and the par- ty has vowed to come down hard on offenders. Wang Zhengshan was a senior official in a de- velopment zone in the northern port city of Tian- jin, China, but he ignored party discipline orders and got into bed with a group of "illegal business- men," said the party's anti-graft watchdog. As he approached retirement and fearing his quality of life would go down, he spent money taken as bribes on buying villas, said the Central Commission for Discipline Inspection. Wang illegally built a private club with three f loors, the watchdog added, describing the building as a copy of the Water Cube from the Beijing Olympics. "It had a swimming pool, gym, tennis court, restaurant, BBQ pit, f lower nursery, and high- end imported mahogany furniture — a crazy level of luxury," it said. It also said Wang had tried to hinder the graft probe by agreeing to a "conspiracy of silence" with other suspects. "Wang Zhengshan is an example of a party official in a leadership position who ignored the law and discipline, acted without regard for any authority, was blinded by lust for money, and went mad in his pursuit of extravagant pleasures." COPS ENCOUNTER SHARP RESISTANCE BROOKSVILLE, Fla. — It sounds like Hallow- een came a bit early at this Florida house. A Florida woman living in a mobile home that was "booby trapped" with more than 3,714 swords, knives, and other bladed weapons has landed in jail after attacking officers who had come to arrest her, police said. Nickcole Dykema, 47, was in custody with- out bond on charges including assaulting an officer and resisting arrest, said Hernando County sheriff 's department spokeswoman Denise Moloney. Authorities discovered a macabre scene when they arrived to arrest Dykema for a probation violation with blades hanging from the ceiling and walls of her mobile home in Brooksville, a community north of Tampa, Fla., said Moloney. When officers knocked on her door, Dyke- ma barricaded herself inside and then lunged at one officer with a sword-like weapon, narrowly missing an officer's head, said Moloney. It took deputies five hours to subdue Dykema and arrest her, said Moloney. According to Re- uters, several investigators suffered minor inju- ries while removing the blades from the home. Authorities said they also discovered booby traps, fake skeletons, rubber Halloween-style masks, and fake severed limbs throughout the residence. "You name it and it was in there," said Mo- loney, adding sheriff 's officials believed Dykema needed help for mental illness. At the time of the incident, Dykema was on probation because of a February conviction for carrying a concealed firearm without a permit, said Moloney. Officers obtained warrants for her arrest after a neighbour accused her of knif- ing a screen window. LT A DAILY BLOG OF CANADIAN LEGAL NEWS FEEDS LEGAL POWERED BY CANADIANLAWYERMAG.COM/LEGALFEEDS FEEDS LEGAL POWERED BY LegalFeeds_LT_Dec1_14.indd 1 2014-11-26 9:44 AM u Bizarre Briefs By Viola James u The InsIde story FRAUD CHARGE OVER LAO BILLINGS Police in Hamilton, Ont., have laid two charges over allegations of $15,000 in overbilling to Legal Aid Ontario. Charged with fraud over $5,000 and using a forged docu- ment is Omar Shabbir Khan, a 44-year-old resident of Stoney Creek, Ont. Police began inves- tigating following a review of in- voices by LAO's audit and compli- ance unit. The alleged overbillings occurred between 2009 and 2013, police said in a media release on Sept. 17. Police released Khan on a promise to appear with a sched- uled court appearance on Oct. 13. None of the allegations has been proven in court. LEGAL SALARIES PROJECTED TO RISE Despite the pessimism about the economy in general, Robert Half Legal expects positive trends when it comes to the market and salaries for lawyers next year. "Hiring in the legal field is gaining momentum as law firms and companies respond to ris- ing demand for legal services," said Charles Volkert, executive director of Robert Half Legal, as it released its annual salary guide last week. Among other things, it pre- dicts average starting salaries for lawyers at law firms to increase by 3.5 per cent in 2016. Robert Half also expects a three-per-cent in- crease for first-year associates over 2015 projections. "Law firms are expanding practice groups to sup- port growth in real estate, corpo- rate law, and litigation while legal departments are building teams to manage more legal matters in- house," said Volkert. LAW FIRMS RAISE $170K FOR RBC RUN Law firms came out in force for the RBC Run for the Kids this month, raising more than $170,000 to support the family navigation project at Sunnybrook Health Sciences Centre. Among the law firms partici- pating was Wildeboer Dellelce LLP, Blake Cassels & Graydon LLP, Davies Ward Phillips & Vineberg LLP, Fasken Mar- tineau DuMoulin LLP, Good- mans LLP, Norton Rose Ful- bright Canada LLP, Stikeman Elliott LLP, Thornton Grout Finnigan LLP, and Torys LLP. They surpassed their goal of rais- ing $150,000 for the third annual run that supports the Sunnybrook program to help parents navigate the mental-health system. TWO LAWYERS ALLOWED TO RESIGN The Law Society Tribunal has allowed a Toronto lawyer to surrender his licence over mis- conduct related to his statutory accident benefits practice. Among other things, it found Erwin Weisdorf had failed to supervise the paralegals in his statutory accident benefits prac- tice and abdicated his professional responsibilities in connection to it. On Sept. 15, the tribunal's hearing division allowed him to surrender his licence to practise law. The hearing division came to a similar conclusion in the case of George Flumian. It allowed him to surrender his licence after making findings of misconduct that included misappropriating money from funds held in trust on behalf of eight clients and register- ing mortgages against real prop- erty owned by two clients without their knowledge or consent. LT Martin Masse "I wonder whose cellphone account provided the data to facilitate this particular instance of targeted marketing."